A part-time taxi driver has taken it upon himself to clean a filthy kasi street! A part-time taxi driver has taken it upon himself to clean a filthy kasi street with vigour and pride. Yamkela Ncume couldn’t stand the accumulating filth and stagnant grey water in Dunoon’s Gousbloom Street, so he started cleaning it himself. Armed with a rake and a shovel, and sometimes just with his bare hands, he removes all domestic refuse and filth accumulating in the street. 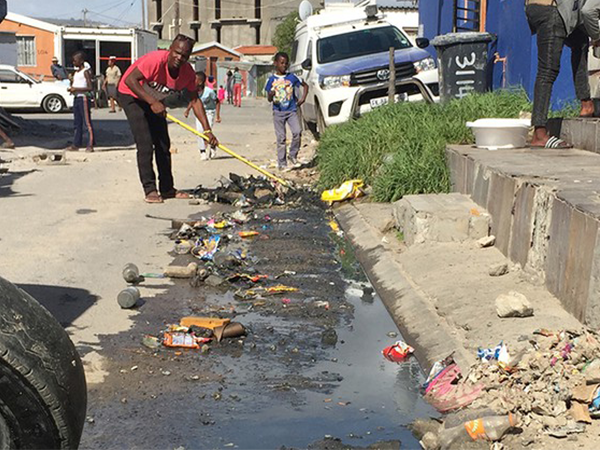 Residents along the street praise Ncume for his selflessness.When GroundUp visited the area on 10 April, Ncume was cleaning the stinking rubbish. “I love my community and I want to keep our street and environment clean. Refuse accumulates very quickly here because of overcrowding, and we have young children constantly playing in the street. If we wait for authorities to come clean for us, kids will pick up germs, ” Ncume said. Nokuphuwa Pitane (35) praised Ncume for his selfless service to the residents living on the street. “He is doing the right thing. Many young people of his age are on drugs but he is not. He cares about our hygiene. My only wish is for him to get a permanent job,” said Pitane, who is the mother of two small children. She said Ncume cleaned the street once a week but refuse piled up again quickly because of overcrowding. City of Cape Town spokesperson Hayley van der Woude said the City’s resources for cleansing were stretched and commercial areas and main thoroughfares were prioritised.